The WaveBrake® mop bucket and wringer system reduces splashing, which means a safer environment, cleaner floors, and improved productivity. High efficiency down press wringer. Lasts twice as long as Side Press Combo, 7580-88. Tested to exceed 100,000 wringing cycles, side press wringer performs 50,000 cycles. Premium tubular steel and Structural Web molded plastic. Included Dirty Water Bucket locks into place when in use, easily removable for emptying. Bucket in bucket system separates clean and dirty water. 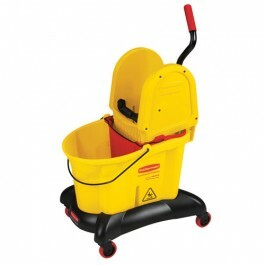 Quiet Caster Dolly makes 1/2 noise of standard mop bucket.